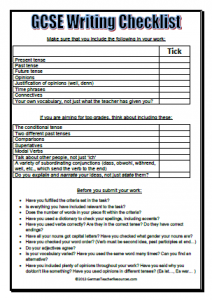 Currently viewing the tag: "Coursework"
A worksheet to help students to self-assess GCSE level writing pieces. 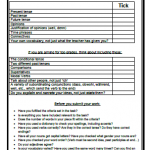 This GCSE Writing Checklist allows students to tick off grammatical criteria to ensure that important factors have been included. It also gives them advice on things to consider before finally submitting a piece of work. Click on the image below to download the worksheet in PDF format. You will find a word mat to help with GCSE written work here.